form the Solar Logoic Centers on the cosmic Buddhic Plane. Who take incarnation as a divine Manasaputra Personality on our Systemic Monadic Plane. The Seven Rishis as the seven solar Logoic head centers are depicted in this graphic as five Kumaras (eternal Youths) around the head of Brahma, just as they are depicted iconographically as five jewels (peaceful emanation) or five skulls (wrathful emanation) in the crowns of dhyani bodhisattvas and Dhyani Buddhas. Just as we as humans are essentially Monads on the systemic monadic plane, and take on Causal Bodies as divine Egos on the systemic buddhic plane, we are only perceived as threefold Personalities in the Three Worlds, and then only as physical systemic bodies by our human and nonhuman environment — we only manifest one-seventh or less of our human natures in infinite time. We only incarnate as souls through alignment and a long series of physical systemic incarnations. We only become conscious as souls through continuity of consciousness through spiral-cyclic space. Time is the perception of Form. 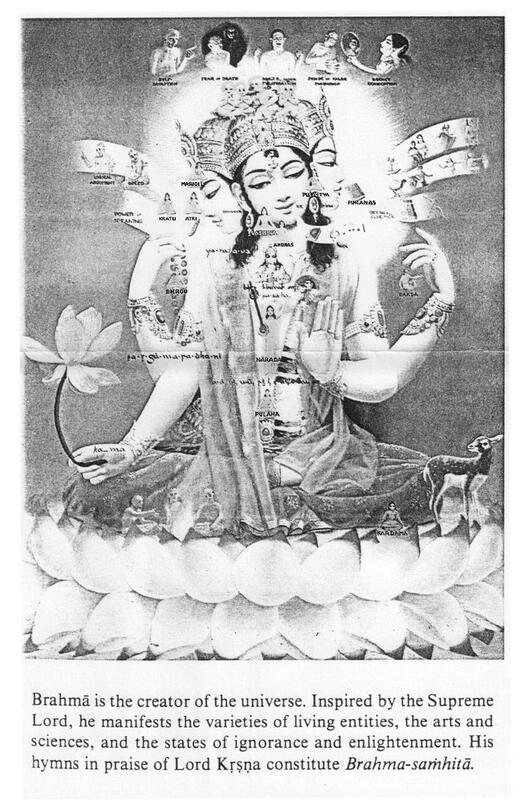 d. The Heavenly Men form the seven centres in the body of the Logos. Therefore, They are the spheres of fire which animate His body, and each of Them expresses one form of His force manifestation, according to Their place within the body. e. Human beings, when centred within their groups on causal levels, form one or other of the seven centres in the body of a Heavenly Man. f. The solar Logos forms one centre in the body of a still greater cosmic ENTITY. Human beings therefore [Page 273] find their place within one of the forty-nine centres (not groups, for a centre may be made up of many groups, corresponding to the different parts) of the seven Heavenly Men. Source: Sri Isopanishad Bhaktivedanta Book Trust. Los Angeles CA. Source: Alice A. Bailey, 24 Books on esoteric philosophy. NY: Lucis Trust.